This post is the 3rd in a series devoted to adapting the literacy tenets of "The Daily 5" to a secondary classroom with 50 minute periods. You can catch the whole series here. I started to write about an activity that I did in AP Stats almost a year ago, but the IEP of "Tre'," one of my new students for the semester, has me stuck here. He is going to need a lot of support reading. "Goals: Reading comprehension- Answer questions across the content areas and answering critical thinking questions independently with 65% accuracy." This young man is a senior with a tested reading grade equivalency of 5th grade. What's even more shocking to me than the stated goal of 65% is that from my experience, those goals are usually optimistic at best. So, without interventions, I have a feeling this student can hit that goal with perhaps 50% accuracy. Maybe you've even been there - (I hope you have challenged yourself this way) - you're reading a text from a subject you know little about and get very confused very quickly. Getting over that hump in my own self-selected readings was my main strategy from moving to a Social Studies certification from college into math. I did some confused reading for a few weeks, but reading real texts (books aimed mostly at the general public, but about mathematics instead of practicing hundreds of drills) is what soothed my mind as I left my first love to (what I thought would be) a much drier, boring, and objective subject. There were probably several things that I read those months of which I could have answered critical thinking questions with only 65% accuracy, but I was able to improve my understanding of the texts because I had reading tools in my back pocket. I knew it was okay to look up definitions of words I wasn't quite confident with (and then definitions of words in the first definition!). I reread some paragraphs (and pages). Sometimes I paused to make connections of the content I was reading to a mathematician or concept I had read about in another book. I knew that having a text beyond my current understanding didn't mean I was dumb, but only that I had more reading to do. 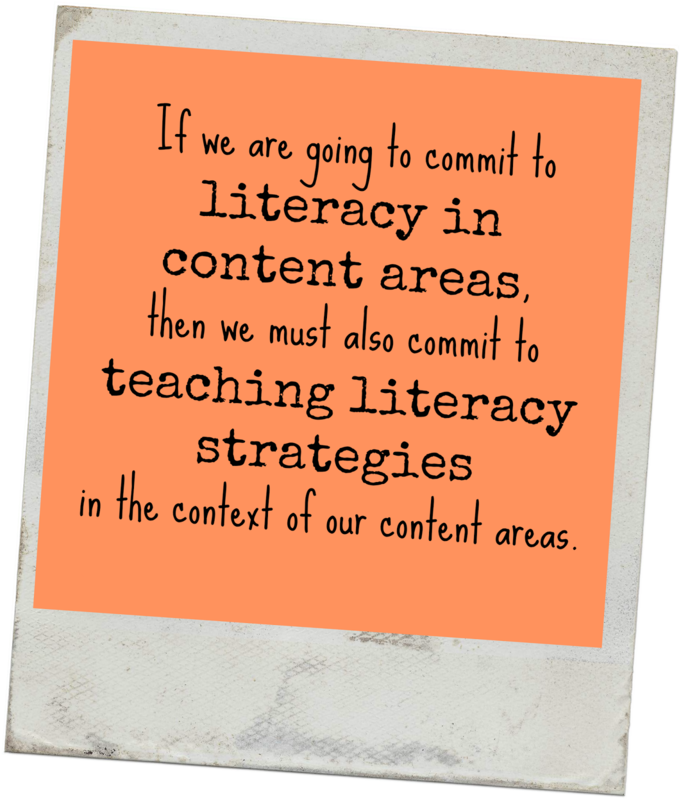 So for "Tre'," its important that if we are going to commit to literacy in content areas, then we must also commit to teaching literacy strategies in the context of our content areas. Especially for students like "Tre'," its apparent that "he'll get it in his English or Reading class" is not going to be enough. BONUS: A Pinterest search of "Reading in Content Areas"